Today, all eyes are on Mantralaya and lakhs of people are glued in to their television sets to watch ETV which is telecasting live the Aradhana celebrations of Raghavendra Swamy in the pilgrim town of Mantralaya, Andhra Pradesh. Both Mantralaya and Bichale record heavy footfalls during the three-day Aradhane which ends on Friday. The maximum number of pilgrims visiting the holy town situated across the Tungabhadra is on Thursday, which is also the day of Madhya Aradhane. It is on a Thursday that Raghavendra Swamy was born and it is on that day 342 years ago that he entered Brindavana alive. Since then, the Aradhane celebrations have been held regularly on this day. This post here is to make people aware of another equally important place in the annals of the Raghavendra era. It was at this very place that the Pattabhisheka of young Venkatanatha took place and this was sometime in 1625. The Nayakas or fedudatory local chiefs were ruling several parts of Tamil Nadu during the 17th century. Places in Tamil Nadu like Gingee, Madurai, Tanjore were ruled by these Nayakas. It was at the royal court of Tanjore when Raghunatha was the Nayaka that Venkatanatha was named as Raghavendra by his guru, Sudheendra Theertha and given the Sri Matha pontificate. Thus it was at Tanjore that the Sanyasa history of Raghavendra commences. The Nayaka had personally made all arrangements for the ceremony to anoint Raghavendra and he had been insistent that it take place at Tanjore, his capital. The ceremony was attended by several leading scholars, seers and leading lights of the day. 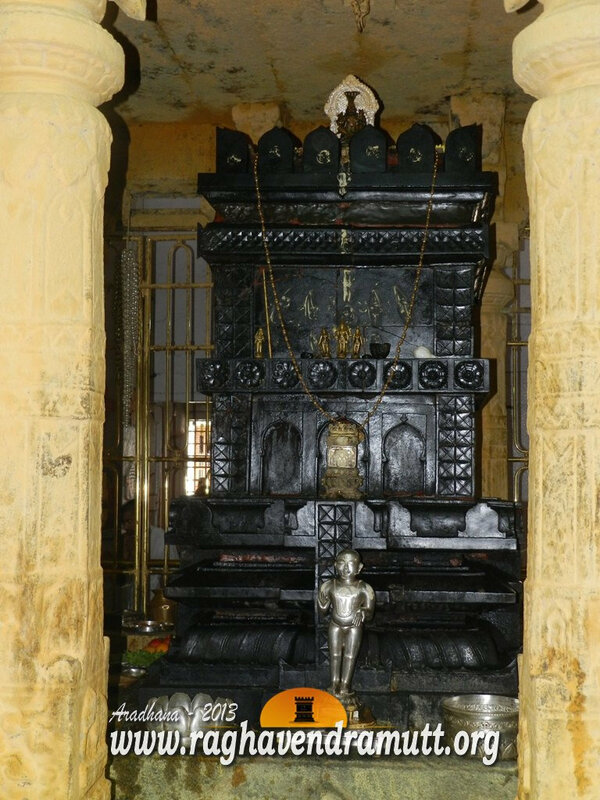 After the ceremony, both Sudheendra Theertha and Raghavendra Theertha retired to the Sri Matha and it is this matha which still exists at Tanjore. This place today is called Vadavaru and it is one the banks of the serenely flowing Cauvery. It was at this place that Raghavendra decided to do his daily ablutions, meditation and prayer. Vadavaru then was a forested area a little off the main city of Tanjore. The river Vadavaru is one of the smaller tributaries of the Cauvery and Raghavendra is believed to have spent twelve years here after his initiation into the Sri Matha. Several decades later, Raghavendra Swamy decided to make Mantralaya his final abode. When the Nayaka of Tanjore wanted Raghavendra Swamy to be near him and bless the people of his Kingdom, the seer came in his dream and instructed him to construct a Brindavana. The Brindavana, Raghavendra Swamy said, should come up at the spot where a snake would appear. It is at this very spot that the Vadavaru Matha was established. The Brindavana here has the figure of a Sarpa and it is believed to be the only Brindavana to be constructed without the holy mrithika. Along with Mantraakshate, the Matha hands out Mrithika as prasada. There is a Nagara Katte in the outer prakara of the temple. The temple is about five kilometers from the city centre of Tanjore and Ayyankulam is a nearby locality. Unfortunately, there is very little information about this matha and its surroundings and fewer people visit it. If you are visiting Bhuvanagiri, you can easily access the Raghavendra Swamy mathas at Kumbakonam, Bhuvanagiri and Tanjore at a time. Tanjore is just 41 kms from Kumbakonam and 110 kms from Bhuvanagiri. You see, Rayaru was born at Bhuvanagiri: He studied at Kumbakonam and he was initiated into the Madhwa order at Tanjore (Thanjavur).